Update: Due to the widespread internet outages on October 21, we’re extending our registration deadline through Monday, October 24 at 11:59pm PT. We’re flying through October, which means our second registration deadline for the 2017 SXSW Conference & Festivals (March 10-19) is just around the corner. Register to attend by Monday, October 24 at 11:59pm PT to save $400 off the walk-up rate, and book your hotel through SXSW Housing & Travel for the best availability. Read more about what’s new for 2017, and explore our programming recap below to get a taste of what SXSW has to offer this March. Interactive, Film and Music badges will now include expanded access to more of the SXSW Conference & Festivals. These improvements will offer industry professionals more opportunities to network and discover than ever before. 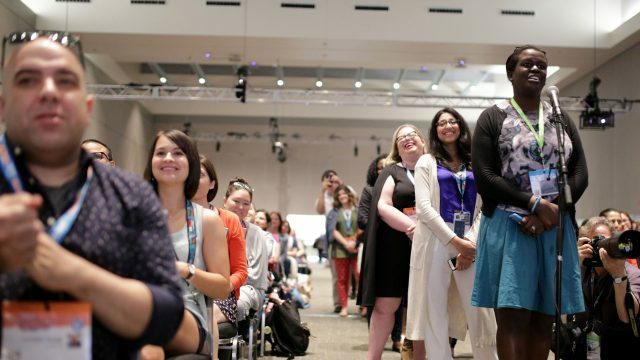 Attendees will still receive primary entry to programming associated with their badge ­type, but can now enjoy secondary access to most other SXSW events. The 2017 SXSW Conference includes 24 programming tracks divided amongst Interactive, Film, Music, and Convergence, presented in a variety of session formats. Learn more by taking the Tracks Quiz – select the programming tracks and festivals that most interest you, then discover what badge fits your needs. Today, we announced our third wave of Keynotes and Featured Speakers, plus 750 sessions for the 2017 event. 750+ Sessions are now live on the SXSW Online Schedule. SXSW PanelPicker helps shape the majority of the 2017 SXSW Conference programming, and also helps us identify industry trends based on each season’s entries. These trends include innovation in the transportation space, the rise of artificial intelligence, more emphasis on innovation within healthcare and an increase in creative industry inclusion. Take a look through the 24 Tracks our Conference programming is divided amongst to be directed to those track-specific sessions on the online SXSW Schedule. Last week, SXSW Music Festival released their first round of 150+ Showcasing Artists including CJ Fly, Charlotte Day Wilson, Imarhan, Sohn, La Dame Blanche, Bash & Pop, The Drums, Lincoln Durham, and more. Sample the sounds of this artist announcement with our Spotify playlist. October 21 also marks the final Artist Application deadline. The late Film Submission deadline is also just around the corner on October 20 – review these submission tips and learn more about our new Virtual Cinema now accepting Virtual Reality and Mixed Reality projects. Apply to participate in one of the many prestigious SXSW categories including Interactive Innovation Awards, Film Submissions, Showcase Applications, SXSW Accelerator Pitch Event, SXSW Release It, and Gaming Awards. Get ready to join us in Austin, Texas from March 10­-19, 2017! Find out which badge is the perfect fit for you – browse registration rates and deadlines, examine the badge comparison chart, and watch our quick video about the improved badge access. After you register, make hotel reservations through the SXSW Housing & Travel for the best available selection of hotels in March located at the pulse of the action. Rooms during March go quickly, so check the availability page and enter your dates to see all available hotels, room types, rates, and amenities. Register and book your hotels before the next registration rate deadline on October 24 at 11:59pm PT.